JOHN LYLE & COY., LTD.
John Lyle & Company Ltd., Carpet Manufacturers, Fordneuk Street, Mile End was established in 1853 by John Lyle. The founder of the factory originally came from Kilbarchan and was closely associated with Mr James Templeton, the founder of Templeton’s Carpet Factory. The fortunes of both firms can be said to be bound together, for the first Chenille Axminster carpets were manufactured by these two pioneers of carpet making. Before chenille was used in the manufacture of carpets it was principally used in curtains and derives its name from its appearance. The word chenille is French for “hairy caterpillar.” The foundation of the material is cotton and wool. The original carpet factory was very small and was situated at the corners of Fordneuk Street and Crownpoint Road. At the beginning a few hand looms were used. With the expansion of the business, due in great measure to the excellence of the carpets manufactured, the factory was extended and the section adjoining Bloomvale House was added. About this time a great number of carpets were imported into the United States of America and Bloomvale Factory was working night and day in order to supply the great demand. The growth of carpet imports into America caused what was known as the McKinlay Tariffs to be introduced. As the taxes were intentionally prohibitive, the imports fell and only carpets of a special type were permitted to enter U.S.A. This new tariff did not affect Bloomvale Carpet Factory, however, for attention was then directed towards the home market, and the continued expansion of the factory necessitated a change in the type of loom used. Power looms were substituted for the old wooden hand looms and entirely superseded the old fashioned machine. It is of interest to note that one of the original hand looms in still in daily use and is used for pattern weaving. As trade developed and conditions changed which increased the demand for Bloomvale products, a further extension became necessary. The whole block from Fordneuk Street to the Episcopal Church, Crownpoint Road, with one exception was taken over by John Lyle. The exception is Bloomvale House, once the mansion of a family, McAuslan by name. The house was situated in what might be termed a pleasant prospect, for green fields sloped down to the banks of the River Clyde. Time and industry have changed the scene somewhat since those days, and Bloomvale House stands as a relic of Glasgow’s early days and is now a rather pathetic reminder of the time when there were green fields in the Mile End. In this connection it may be of interest to note that Brook Street and Greenvale Street derived their names from the once pleasant scene. The brook can still be seen in Brook Street, but it is in rather a polluted condition compared with the once clean sparkling water. In 1888 the founder of the firm died. He was a likeable man with a kindly nature and proved his business abilities by setting up the industry at an opportune moment and having maintained the reputation he first earned as a manufacturer of carpets. The son of the founder, Mr John Lyle junior and the father of the present owners took command on the death of Mr. Lyle. The war period was a searching test of the abilities of the manager, but he proved his worth by successfully guiding the business through these years while the younger members of the family served with the colours. When Mr. John Lyle died in 1921, the employees lost a friend and good employer, for he was deeply respected by all. The present managers of the business, Mr. John E. and Mr. James Lyle have succeeded in following family traditions. The aftermath of the war and subsequent trade depressions was passed successfully. When many concerns were in a precarious position, Lyle’s Carpet Factory was as stable as ever, due to careful handling during the lean years. The results of such fine management have been steady employment with very little short time and an unusual absence of unemployment for the employees of the firm. It is of interest to note that one of the original winders in the factory died very recently in Stobhill Hospital at the very advanced age of 104 years. The chief products of Bloomvale Carpet factory are seamless Axminster squares and rugs, and the markets supplied are the Home and Colonial markets. The relations between employers and employees have always been of the best. 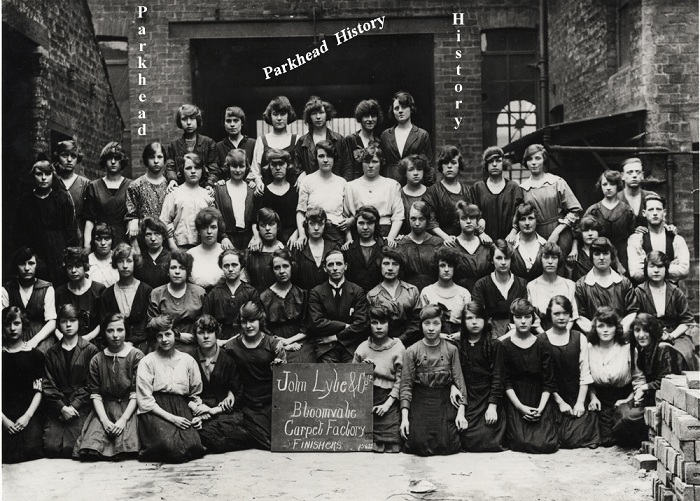 Due credit must be given to the employers as well as to the employees for this state of amicable affairs, and, in spite of trade depression and high manufacturing costs, the firm of John Lyle and Coy., Ltd., continues to flourish and be a source of constant employment to East End carpet weavers and long may it continue. My grandfather Archibald Wilson and his wife Isabella Muir (Wilson) worked at Lyles in the nineteen twenties, He was a power loom operator and she was a lace curtain darner. They lived at Yate Street off Great Eastern Road (The Gallowgate) My mother Isa Wilson (McIvor) and her sisters Marion Jenny and Martha also worked there in the nineteen thirties. My mother spoke very highly of the workmates and conditions. She had a soft spot for Lyles all her life. I worked in Lyle’s as a spooler from 1961 until 1964 and absolutely loved it. It was piecework and if you had a reallyj intricate pattern to spool you didn’t make much money, however if it was a simple patter you could make great money if you were a “hasher” the shifts were murder polis but when you are young it was not bother. I remember around 71 they had a big sale, not sure if the factory was closing down but I got three massive rugs really cheap. and great quality, I lived in Fordneuk st and was waiting for an offer of a house as the building was being demolished…Eddie Brollie was the man who worked there and got us the bargains.. Does anyone remember Violet Weir, who worked in Lyles for years..
lyles did open in c/nauld,and manufactured for a few years was mainly tufted carpets,i also worked in burroughs factory for 4/5 years.